Alongside Japan and any team that has played Team USA, Argentina Roller Derby has been one of the firm crowd favourites at this World Cup. This was no doubt helped by the courage they showed in skating with only eight players throughout the weekend, including against France in the quarter finals when they were forced to forfeit with only three skaters left after five fouled out. One of the most touching moments of the tournament came at the end of that game, when The Beast picked up his seventh penalty and was consoled by France’s Bravehurt and other French supporters as he left the track. The support they’ve received from all of the fans has been similar, pure raw emotion which has had a hugely positive impact on the team. “Our morale was boosted a lot, it was a surprise for us and we feel full of pride,” says Sanchez. “It was beautiful for me to feel that, so far away from home, we had people that were cheering for us and supporting us. I could really feel the love of the people and that is important when we are so far away, knowing that people came to cheer for us,” added El Pibe. The support even helped to make up for the short roster, much like the Twelfth Man of Seattle Seahawks fame: “I felt emotional but all the tiredness I was feeling just disappeared,” said Sir Ar2. Stomp Trooper skates in England with the Hulls Angels Roller Dames. She originally planned to come and cheer on her countrymen but days before the competition was drafted in to help translate on the bench. Few people here in Birmingham expected the team, with their small roster (mainly owing to the economic situation in Argentina), to make it through to the next round. What makes this feat all the more amazing is the lack of time the skaters had spent together before the tournament. “We never knew what would happen as many of us didn’t even know each other before we got here. Our big goal was just to move to the second round,” said Sanchez. Now, Argentina hope their experience at MRDWC will make for an exciting future back home. “Because of how we felt here, with all of the support of the people and the support from the people of Argentina who are following the stream and on Facebook, I think it may become a bigger thing when we go back with more support and more people playing, not only as a sport but as a social thing as well,” added El Pibe. Given their performances in Birmingham this weekend their place in roller derby history is most certainly assured. I want to make clear that the it was not the beast, it was OptimuzQuad Argentinian captain the one you mention. Pride that is the only word it could describe what we feel here!! The whole derby scene in argentina woke up at the break of dawn to cheer for our eight gladiators, who represent us so well. They are the best, but ten other guys had to stay here, because they couldn’t afford the trip. 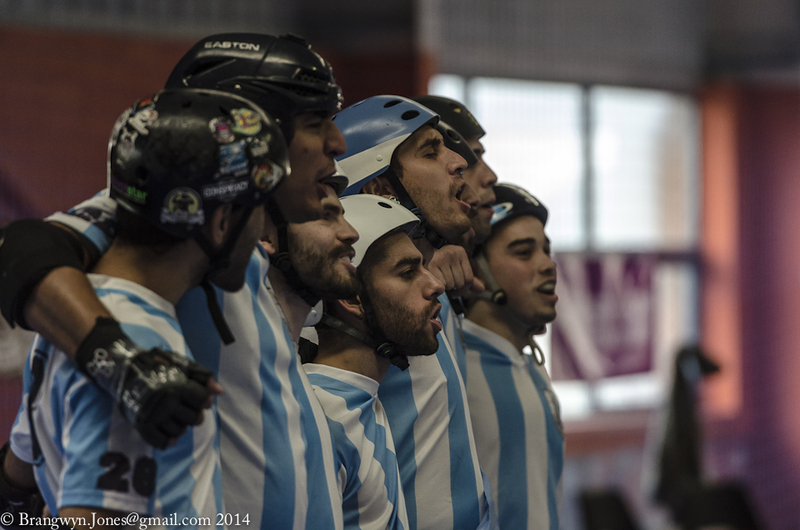 Next time we will show you that this is just a small taste of what’s Argentina in men’s roller derby. I want to make clear too, that the problem is not about the economic situation of Argentina, the real issue is about have not sponsors at all, and support from the Secretariat of Sports in the country. Anyway, this e big mens will be back soon, to put all their talent on the track. ¡Vamo arriba el All Star argentino! Y todo el derby de nuestro país y toda Sudamérica. It seems to me that it’s not just about the lack of sponsorship. The lack of sponsorship is probably a result of the economic situation. I’m sure if the other skaters had been able to afford it they would have come regardless of whether they had sponsors or not, hence the article is correct in saying that the economic situation was mainly why only so few made it. Maybe the economic situation of each individual skater, but not of the country as a whole. You cannnot make a generalization. Hey guys, Beat Monkey here (I wrote the piece). The line about the economic situation, although not a direct quote, came from what many of the players and bench staff told me in my conversations with them before and during the weekend, just to clarify. Your games have been the highlight of the weekend for me. I feel so inspired by you guys. ARGENTINA! I am Australian and watching that game, I was so torn! I wanted our Wizards to win, but if we were going to go down to any other team, I’m glad it would have been Argentina. You guys ROCKED! Huge fan! An awesome display this weekend, gentlemen. I can’t tell you how amazing it was to hear a hall packed with UK people chanting AR-GEN-TI-NA!!! at the top of their lungs. I love that derby brings folk together in that way.